In winter, which way is the most efficient to warm yourself? 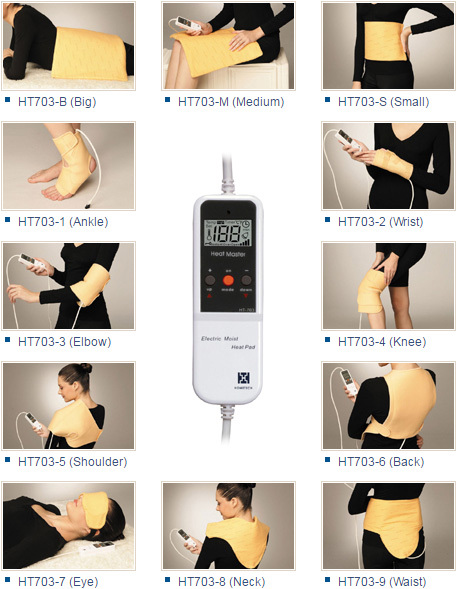 And which heating therapy device is the most convenient and easiest? HT703 is designed conscientiously and creatively for both safety and quality, and surpasses traditional products on the market. With a smart identification control system including PID and Fuzzy design, it can identify different positions and specifications of the heating pad to always keep it in the most suitable heating control mode. It can be manually set to control and display; the temperature, instantaneous heating, peak temp., time setting, automatic, alarm, condition, overheat, warm up...etc. This patented heating pad is bendable, has fast heat transmission, uniform temp., is soft and thin, and is shaped in any size, so you can use directly for wrist, ankle or other specific positions of the body for hot compress. Our patented hydro-gel releases water slowly to prevent skin from drying out and itching. Also the energy of moist heating is greater than dry heating, so the heat will penetrate deeper into tissue layers for improving the efficiency of the hot compress. Safety is the first consideration of our heating pad. 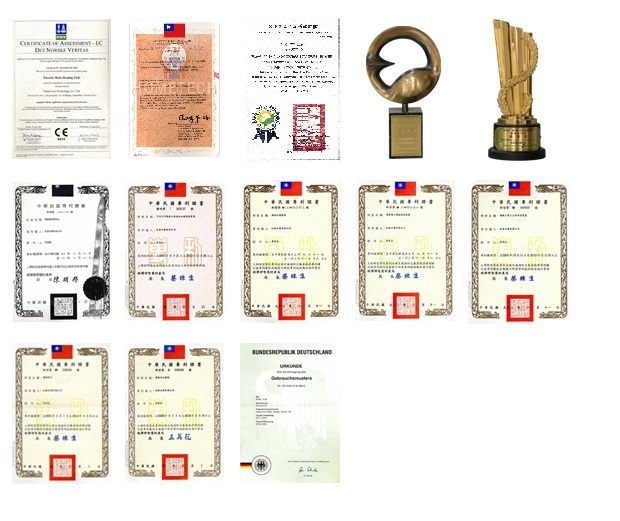 In addition to being certificated by CE/ISO 13485, GMP/ class II, it is also confirmed by our National Biotechnology and Medical Care Quality Award, the Symbol of National Quality and the Annual Pharmaceutical Technology Research Award certified by the Taiwan Department of Health. HT-703 takes out 7 domestic and foreign patents. There are 5 safekeeping designs: Fuse device, Microprocessor controller, 2 channel relay, Temp. Switch, and a plastic heater which automatically melts when overheated, shutting the unit down. Taiwan Patent no. I283137 PID and Fuzzy Control System, it can identify different positions and specifications of the heating pad to always keep in the most suitable heating control mode. Can not change heating pad for professional therapy requirement. Taiwan Patent no. 179173 Innovation soft printed heating pad is designed as many printed heater components with different specifications and parallel connection with power. This component can individually adjust heating power to make an average temperature. Make electric wire series connection with power and fix wires inside the pad, with heat spot. Taiwan Patent no. M256659 When uncontrollable power input accidentally happens (such as lightning strike or ultra high voltage), safety material heating pad will automatically be melted within very short time to protect user from burning. Traditional wire needs much time and high temperature to be melted, it will cause burning. Taiwan Patent no. I283137 Use Full Phase-Control for output power, it does not produce electromagnetic radiation during heating process for long-term use without harming health. Use simple heating controller, low cost but not safe. Taiwan Patent no. M240203 100% cotton cover cloth is moisture-absorbing, and can provide about 15mins of moist-heat compress. On the other hand, our Hydro-gel pad can provide over 2 hours of moist-heat compress Traditional moist-heat pad not covered by cotton cloth, and there is no hydro-gel pad for providing moisture. Taiwan Patent no. 246933 Connection of wires and heater covered by PC box for avoiding open or broken circuits, and short or bad connection because of bending. Temp. sensor, temp. switch and other high sensitive components are all put inside to ensure accurate temp. control. Without this design, it has broken circuits, short or bad connection because of bending and temp. controller does not work efficiently. Do not put hydro-gel pad into boiled water for heating. Before use, please make sure the plug is correctly inserted. Please wait for the temperature to return to normal if you feel the moist heating pad is over heated. Please pay attention to the temperature of the heating pad if it is used by children or people with disabilities. Do not apply heat therapy with high temperature for an extended period. Using cold therapy, please put hydro-gel pad inside plastic bag and seal the bag, then put it into refrigerator. Do not put heating pad and controller into refrigerator. Please unplug before changing electric heating pad. Make sure the connector is fixed well before you plug-in the unit. Do not use accessories which are not enclosed with our product to avoid unnecessary danger. Certificated by EN60601-1-2 of 93/42/EEC Electromagnetic Testing and EN600601-1 Safety Testing. Do not use this product within one meter of shortwave equipment. Keep product clean and dry and use from -10°C~40°C and 90% humidity. Do not wash this product and heater, the cover cloth can be washed. For speeding up heating efficiency, we suggest to use the thick coarse cloth to contact the skin when the hydro-gel pad is not used. You can use the thin/thick side when using the hydro-gel pad.